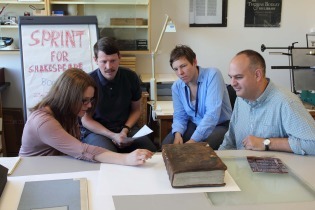 Nicole Gilroy, who heads the team of conservators working on the First Folio, is keeping a diary of their work. Read more about the work here as it progresses. The First Folio has arrived in the Conservation workshop and our stabilization work has begun. The first task was to examine the book closely and to plan the treatments needed to protect it during photography. This is a very unusual project, because the repair we carry out will be extremely minimal, so much so that after treatment the volume will still not be fit to be handled normally, such as might be expected in a reading room. This is for two reasons: one being that the time available is very limited (we have the volume in our workshop for only two weeks), but most importantly, the unique damage to this copy of the First Folio is crucial evidence of its history and usage. The volume has never been rebound, and apart from some paper patches added in the eighteenth century by its previous owner, the collector Richard Turbutt, it has never been repaired. Far be it from us, then, to interfere with it more than is absolutely necessary. Still, there are some causes for major concern associated with the plan to photograph every page of the volume. The photograph taken in 1905 to illustrate the publication The Original Bodleian Copy of the First Folio of Shakespeare (The Turbott Shakespeare), put out by the Clarendon Press, shows a tear in the leather along the joint of the upper board. Sadly, over the past 107 years that tear has extended to half the length of the board, with breaks to the actual sewing supports meaning that the attachment of the board is very fragile indeed. Even with the utmost care in handling, opening and supporting the book repeatedly for photography will still cause the board attachment to deteriorate, and to repair a detached board is not a process that can be done without significant interference to the structure of the book. Our first job, before even looking at any treatment needed to the leaves of the textblock, is to support the board attachment and take the strain of opening away from the last remaining piece of leather. Today and tomorrow we are working on creating a suitable laminate of toned Japanese paper that we will attach at the joint of the textblock, and which will support the opening of the board while preventing further tearing of the leather. This entry was posted in conservation, project and tagged book history, conservation, conservation diary by Sarah Barkla. Bookmark the permalink.